Blood 2012 119(26), 6255-8. Doramapimod (BIRB 796) purchased from Selleck. Effect of blockade of p38 or MEK on MK2 activation following TLR stimulation in moDC. MoDC were pre-treated with p38 inhibitors SB203580 10 mM (S), BIRB0796 (B) 0.1 or 1.0 mM or MEK inhibitor UO126 10 mM (U) for 1hr followed by poly I:C/R848 stimulation for 30 min then Western blotted for p-MK2 with β-actin loading control. Int J Cancer 2014 134(3), 575-86. Doramapimod (BIRB 796) purchased from Selleck. 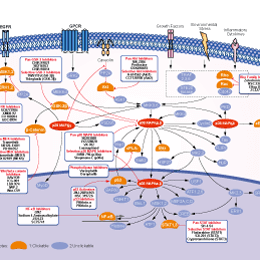 A p38α/ERK crosstalk exists in CRC cells and tissues. Use of a structurally and functionally different p38α inhibitor (BIRB-796) confirms ERK1/2 phospho-activation. Using BIRB-796 for up to 72 h triggers MEK-ERK1/2 signaling in HT-29 cells. Cancer Lett 2012 324(1), 98-108. Doramapimod (BIRB 796) purchased from Selleck. Inhibition of p38 MAPK activity prevents induction of autophagy by glucose. NIH 3T3 cells were incubated in KH medium without glucose in the presence of the p38 MAPK inhibitor BIRB796 (50 nM, middle panels). After 30 min, glucose (10 mM) and lysosomal inhibitors were added to the indicated samples and cells were further incubated for 2 h. Cell lysates were collected and processed for SDS/PAGE. LC3 levels were detected and actin served as a loading control. The values shown in the histograms represent means盨.D. from three independent experiments with the LC3-II levels normalized to actin and expressed as a percentage of the values of KH medium without glucose. *P<0.05. Glc, glucose; w/o, without. Biochem J 2014 449(2), 497-506. Doramapimod (BIRB 796) purchased from Selleck. Doramapimod (BIRB 796) purchased from Selleck. 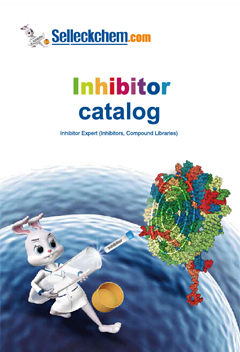 The first p38 MAPK inhibitor to be tested in a phase III clinical trial. Pargellis C, et al. Nat Struct Biol, 2002, 9(4), 268-272. Regan J, et al. J Med Chem, 2002, 45(14), 2994-3008. Kuma Y, et al. J Biol Chem, 2005, 280(20), 19472-19479. Yasui H, et al. Br J Haematol, 2007, 136(3), 414-423. Dietrich J, et al. Bioorg Med Chem. 2010, 18(15), 5738-5748. Regan J, et al. J Med Chem, 2003, 46(22), 4676-4686.